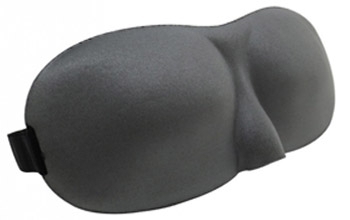 The Travel Easy Grey sleep mask is designed to block out light while maximising comfort. Perfect for use at home or on the go, this sleep mask will help you get to sleep where ever you are. The soft finish will feel luxurious and comfortable on your face, while the light blocking foam provides extra cushioning for your rest. The 3D contours of the mask allow for the best possible fit meaning the mask is useful at blocking irritating light at night or during the day. It is also important to allow freedom for your eyes to open and for eyelashes to move which is why the contour has been designed into the mask. The 3D mask is suitable for everyone as it is fully adjustable with the use of the velcro straps. These make it easy to put the mask on easily while on the move. The use of elastic straps also allows the mask to create the right fit to sit on your face without being too tight.